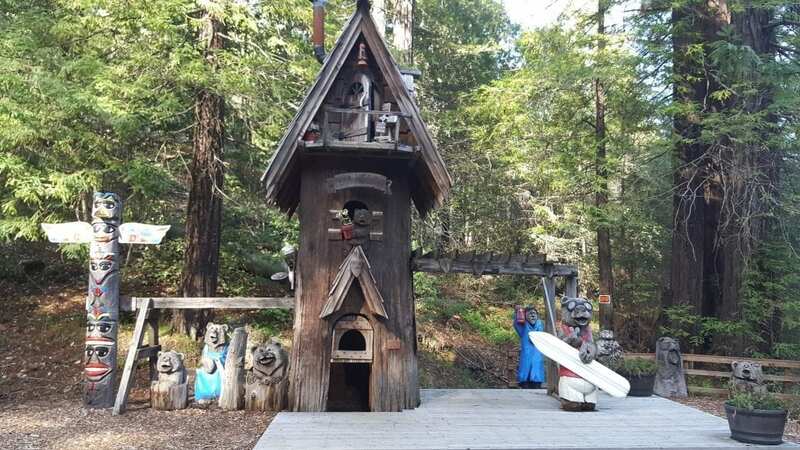 After leaving Maitreya Mountain Village that afternoon, I headed toward the great Redwood forests of Northern California. 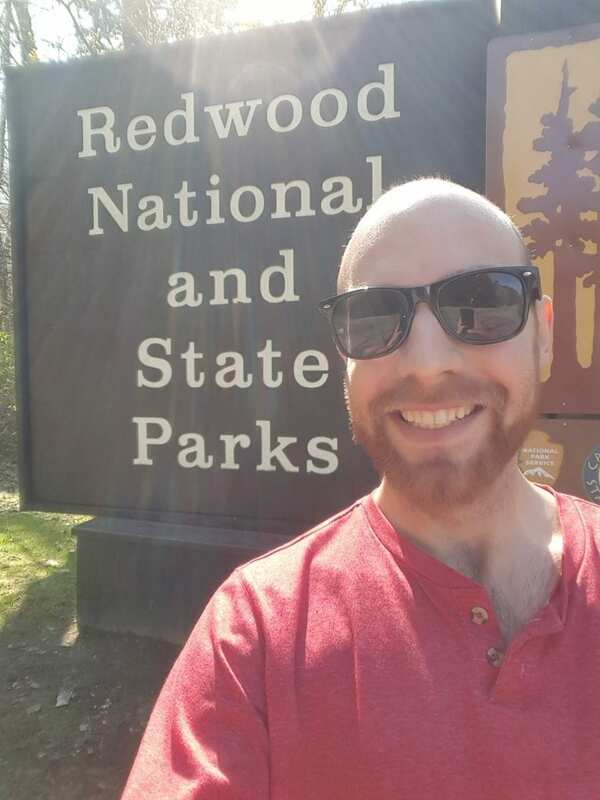 I drove southwest on the highway till I got to Jedediah Smith Redwoods State Park and where I saw my first Redwood trees! 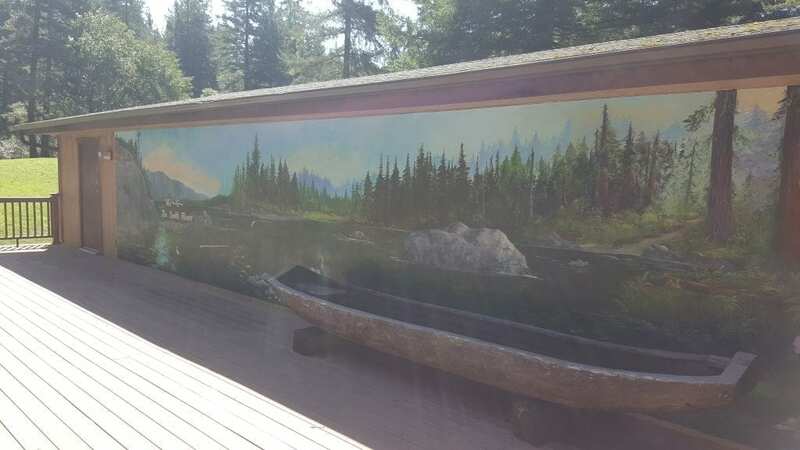 A replicated Redwood carved canoe in front of a mural – ideal for tourists! 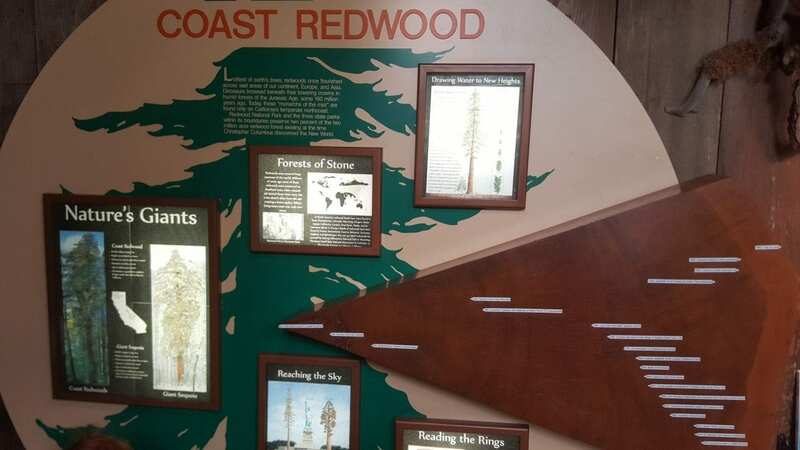 This tourist display at the information station featured informational boards as well as a marked cutting from a Redwood indicating historical weather events. 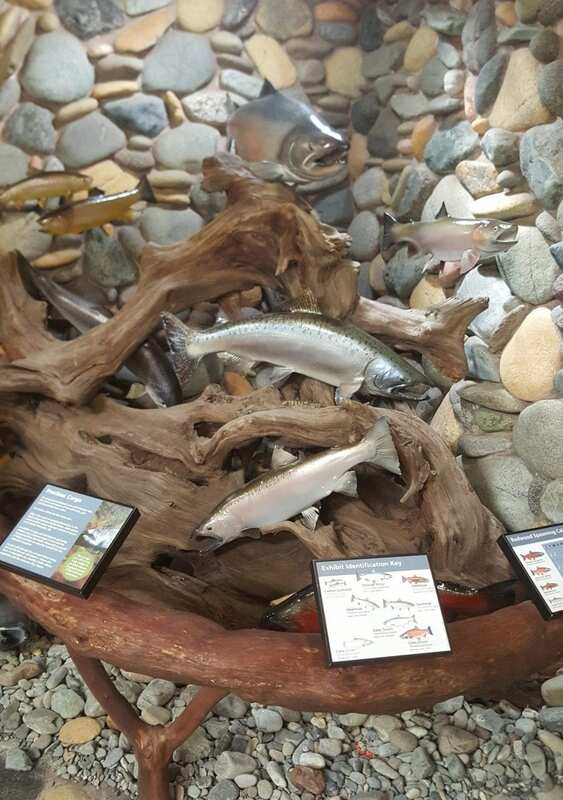 There was also a display in the corner of the tourist station showing some of the local fish populations. 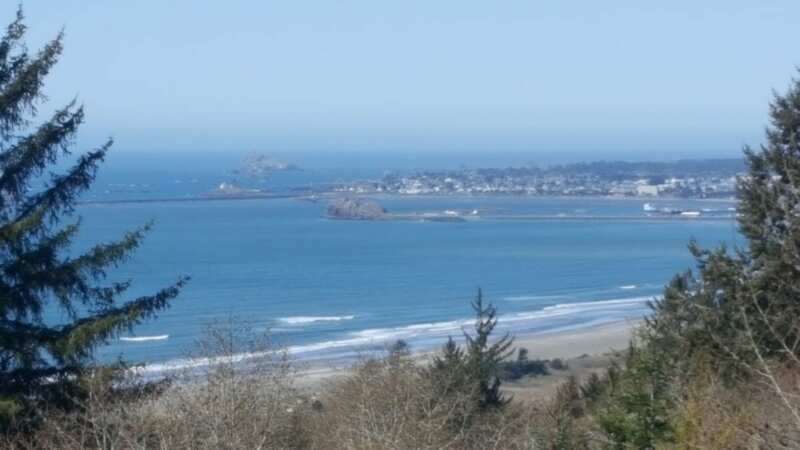 Continuing my drive down Highway 101 and wanting to get back into view of the Pacific Coast, I drove till I reached the coastal town of Crescent City to enjoy the ocean view. 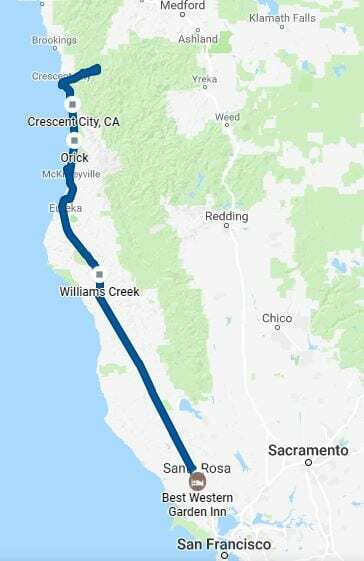 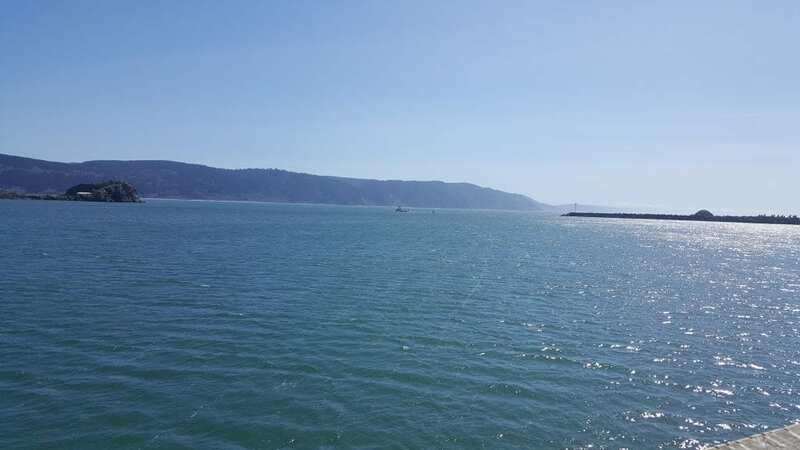 One of the destinations suggested by Google was the B Street Pier, where I walked the entire length, over the ocean, and saw crabbers and fisherman spread out across the pier, and saw Battery Pont Lighthouse from a far before I hit the road again. 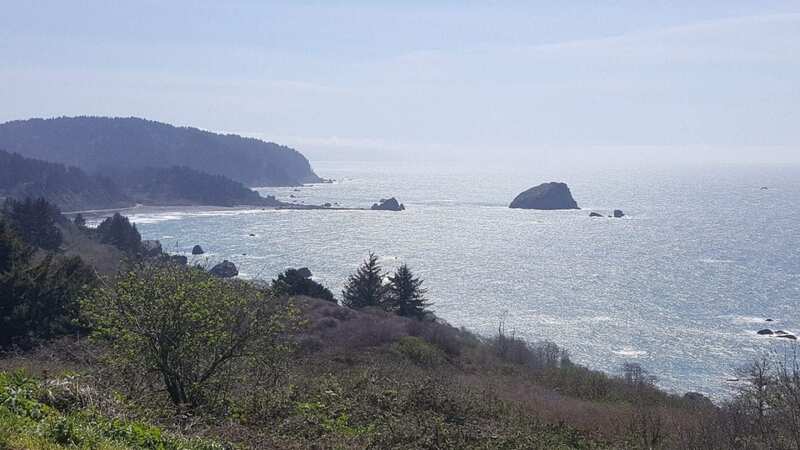 As I drove up the mountain side overlooking Crescent City, I stopped one final stop for a scenic picture of the town and of the Redwood state park sign as I continued down Highway 101. 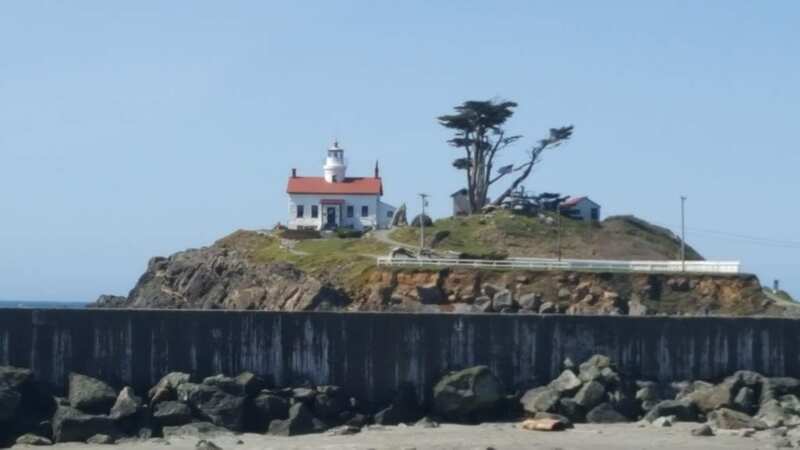 Along the way, there were many “tourist photo pull-over’s,” but I was more interested in being on the beach versus a photo overlook. 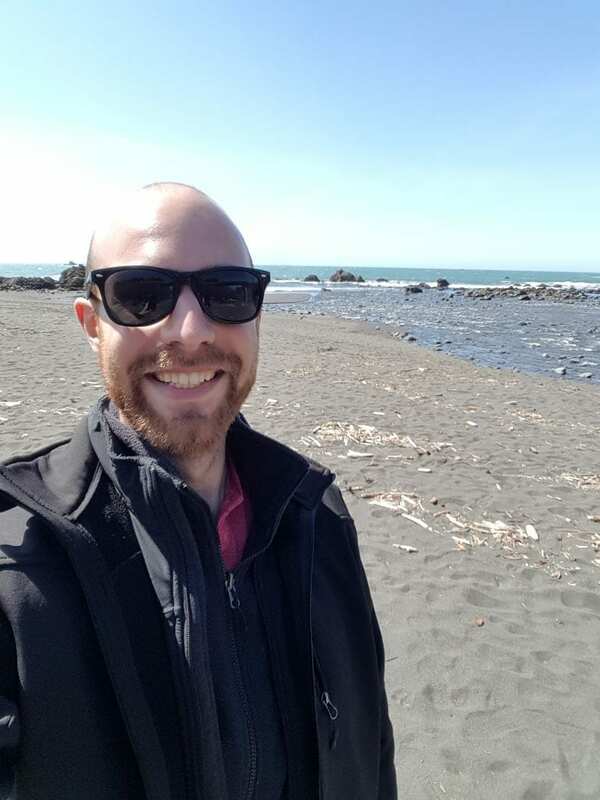 So when I came to a beach that looked promising, I pulled over. 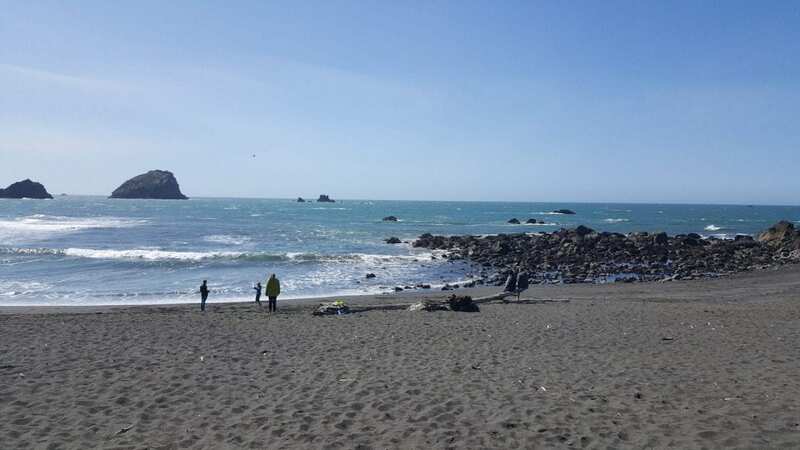 There was one large beach with several parking lots for tourists, which I took advantage of and stopped at. 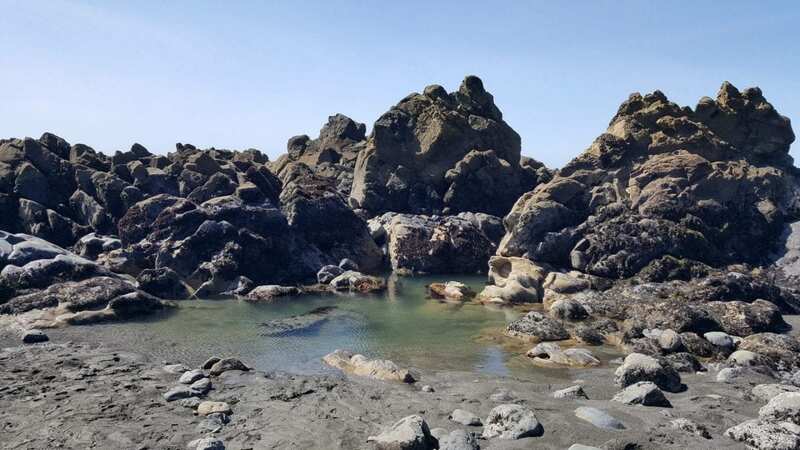 I strolled along the dark sands, exploring the tide-pools, shifting through the driftwood and sand looking for rocks to add to my new collection. 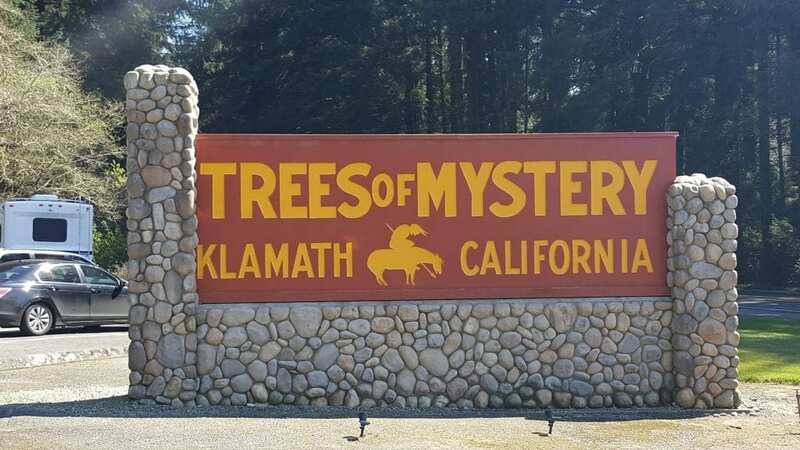 Hours later, I arrived at the Trees of Mystery Redwood attraction in Klamath, California. 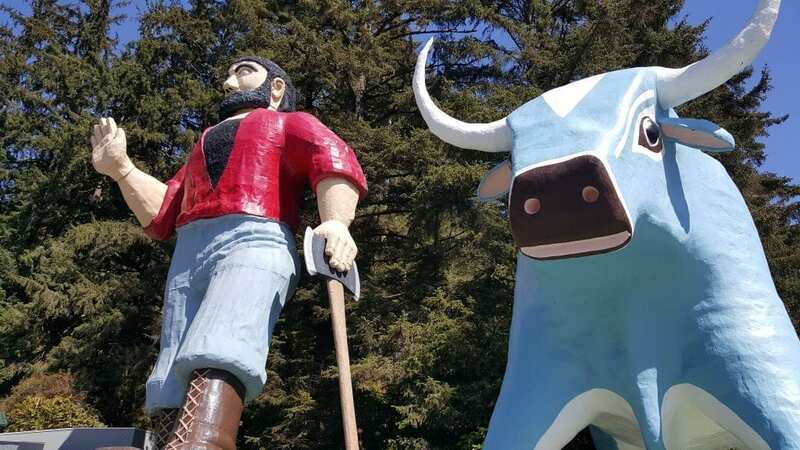 I didn’t have enough time to ride the tram or hike through the trails, but I did see the giant Paul Bunyan and Babe the Blue Ox statues and venture into the gift shop! 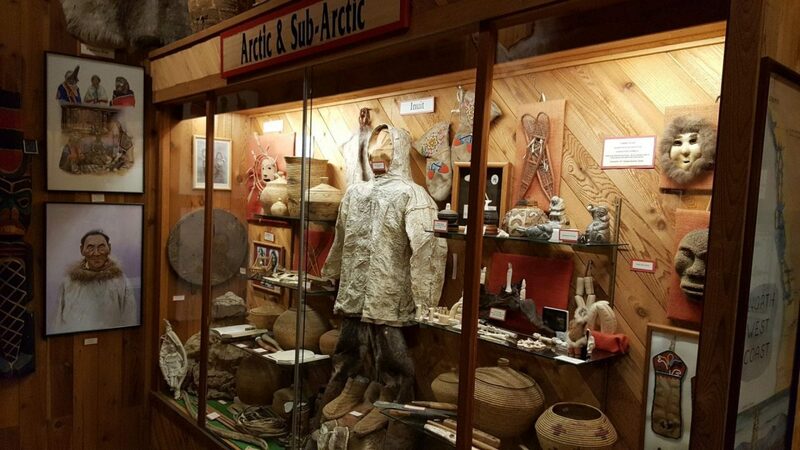 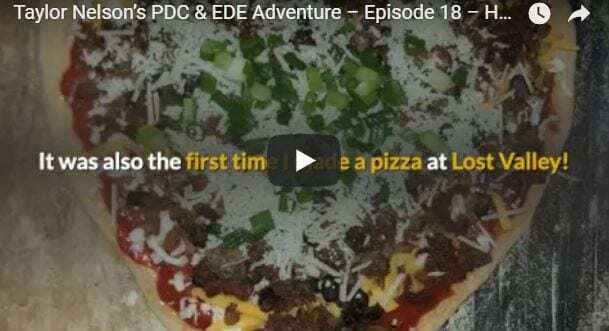 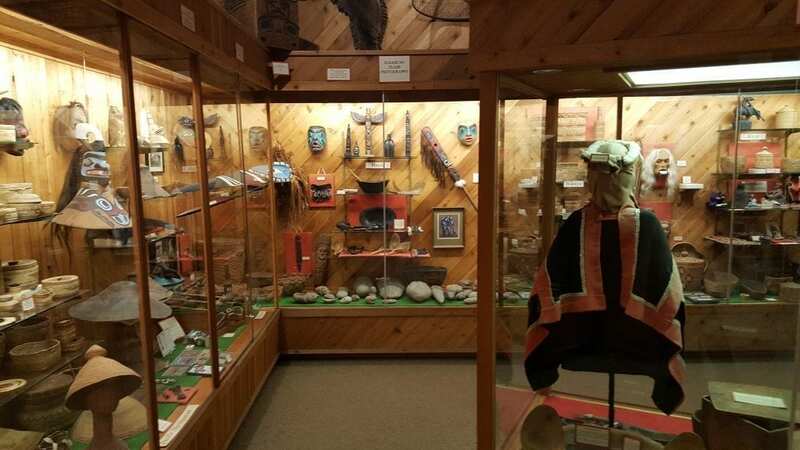 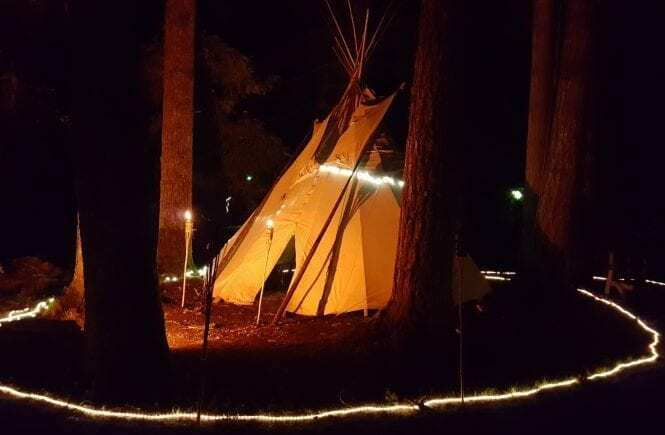 “The End of the Trail Museum is attached to the north end of the Trees of Mystery gift shop and is one of the largest privately owned world class museums there is. 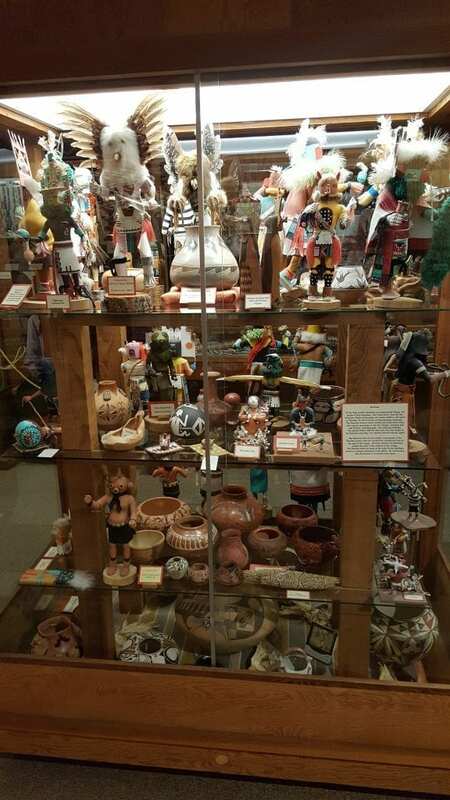 It has been painstakingly assembled over a period of about 40 years by Marylee Thompson, and her heart is in every item on display here. 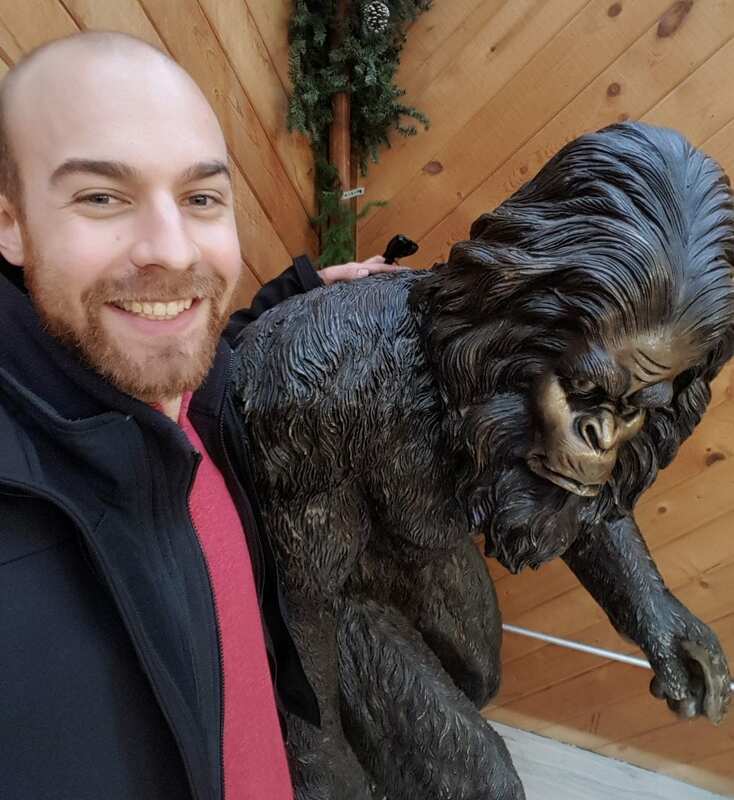 And before I left to continue my journey, I took a selfie with Bigfoot! 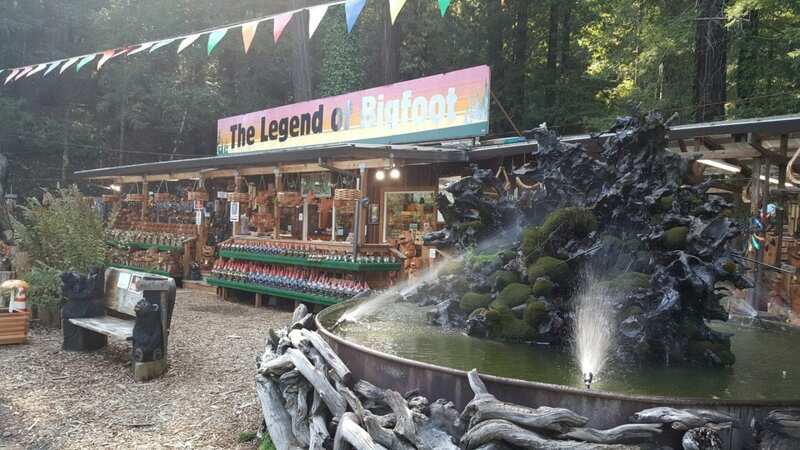 Towards the end of my travels for the day along the coastal redwood highway, I saw several billboards advertising for an upcoming gift shop – the Legend of Bigfoot Gift Shop. I pulled over at the gift shop in Garberville, CA, which was also a chainsaw-carving competition and display area, a nice surprise before my long night drive to Santa Rosa. 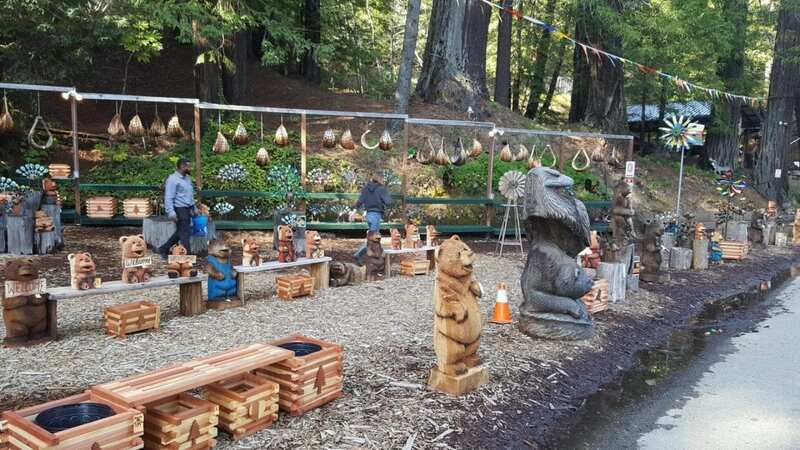 The chainsaw carving grounds were very impressive! If you look at the furthest beam under the workshop, you can see silhouettes of the many trophies that have been won onsite. 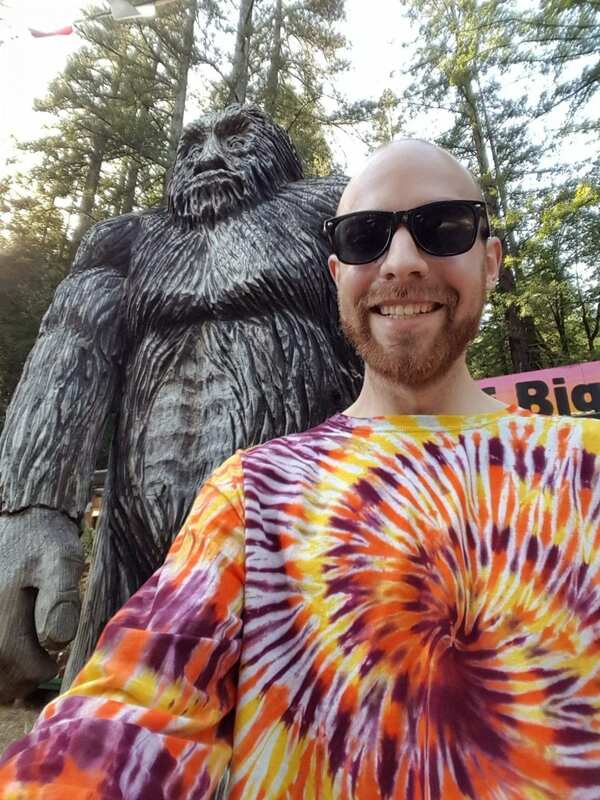 I can’t get enough selfies with the Bigfoot population around here! 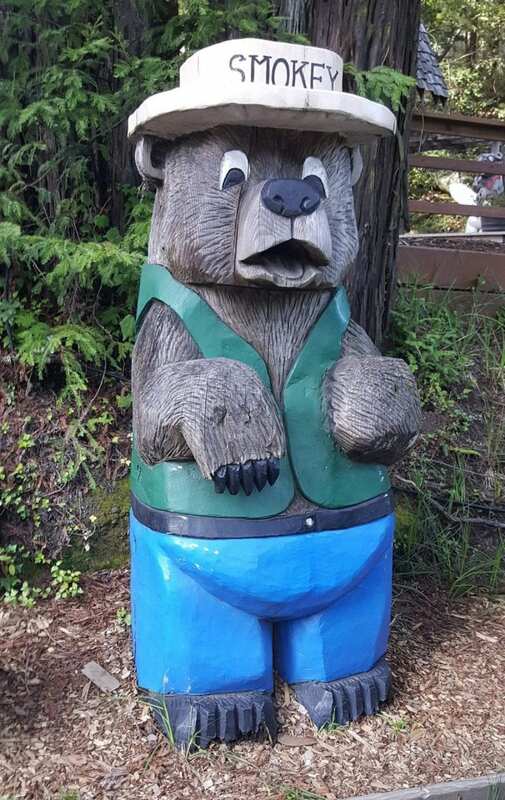 Pinocchio was a pleasant surprise! 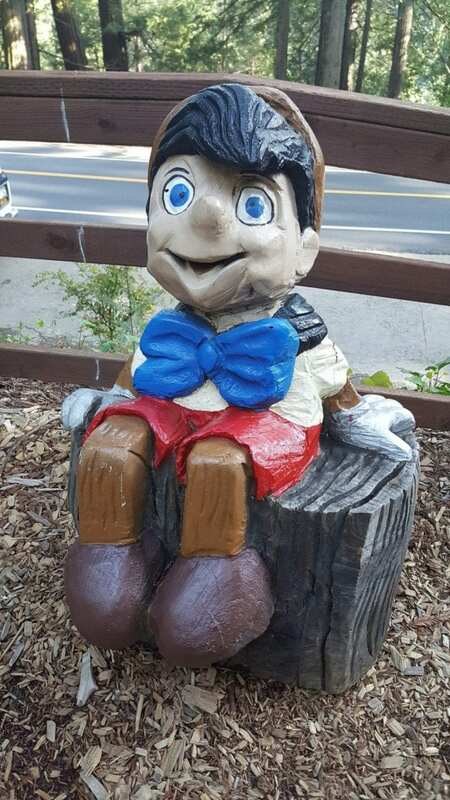 I used to live on Pinocchio Street in Dallas, Texas as a kid, so he has a special place in my heart. 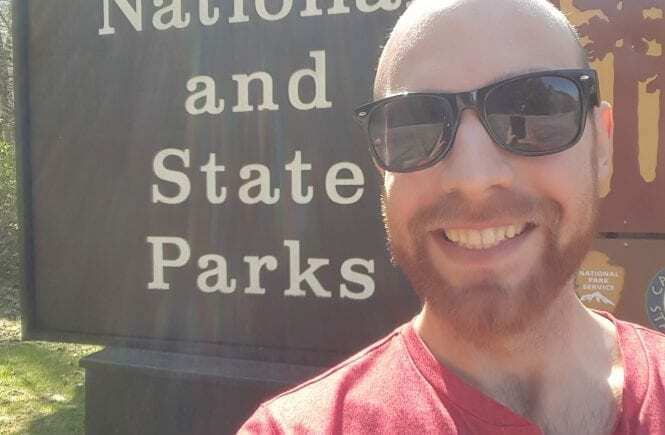 Especially when you think about his pursuit of “becoming a real boy,” something comparable to what I’m working on myself – being more real and authentic with my life, instead of being a puppet controlled by others. 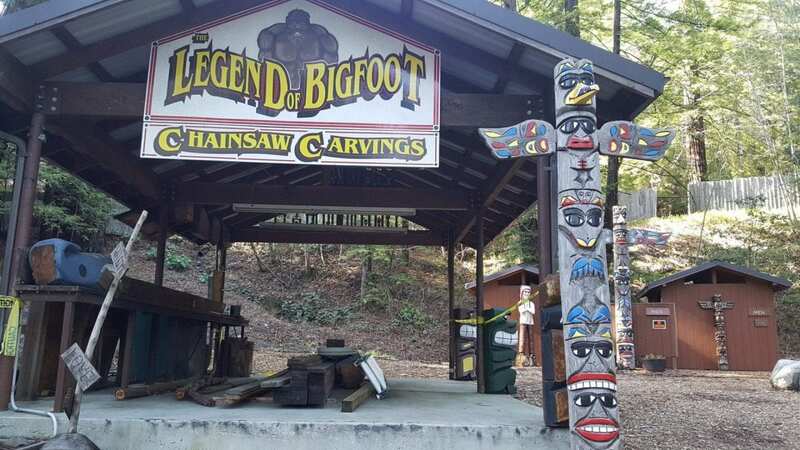 This stage is where most of the competition carvings are presented during judging, along with hosting other outdoor events. 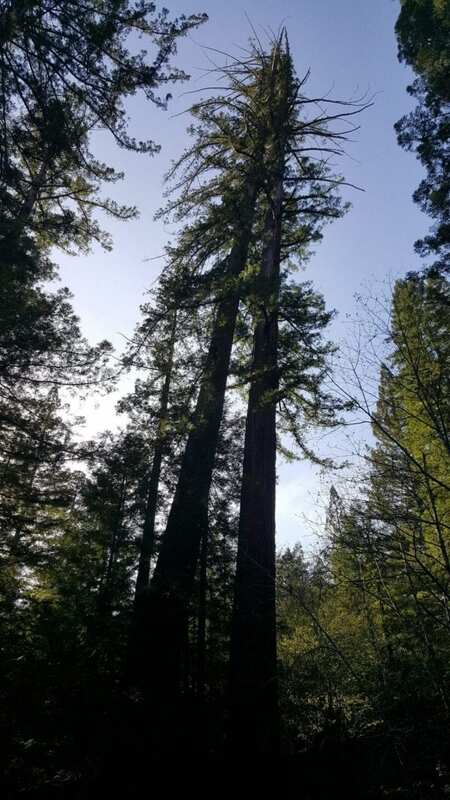 Finally a picture of a Redwood tree! 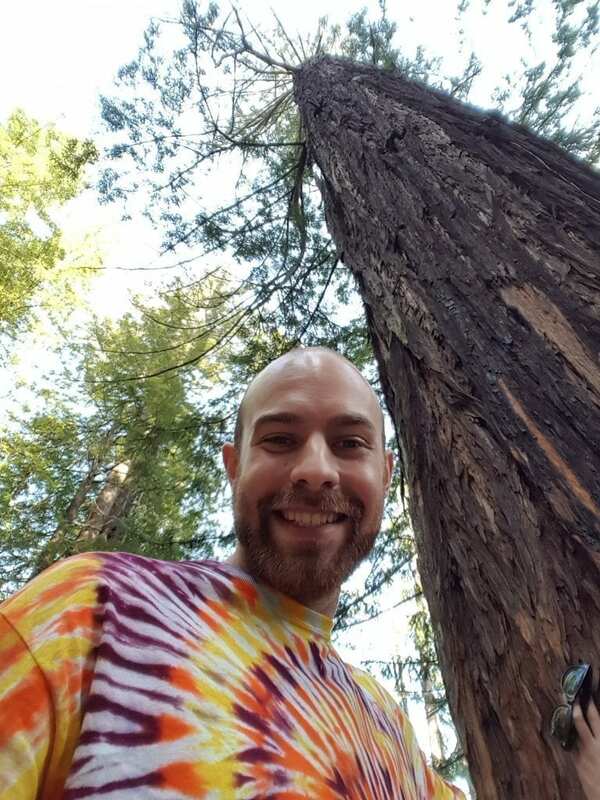 And a selfie with a Redwood tree!